The Latest Face of Lancôme: Emma Watson. Lancôme announced this morning that they have just signed on British cutie Emma Watson as their newest ambassadress. 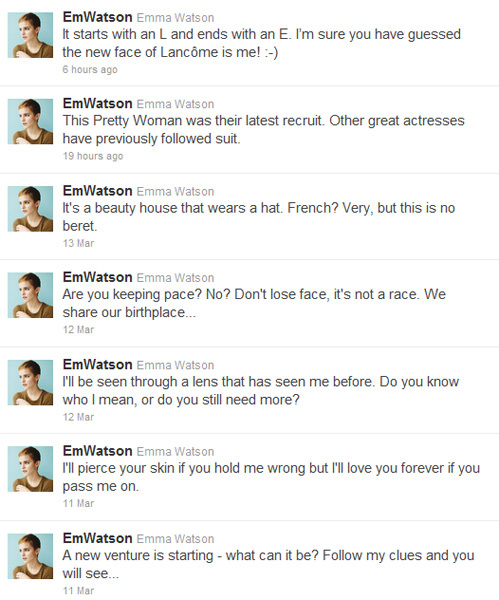 You can follow Emma over on Twitter @EmWatson. “Thanks to her charm, romanticism and her incredible modernity, Emma Watson has become the icon of her generation. We are delighted by this new collaboration with Emma who brings a fresh spirit to Lancôme”, says Youcef Nabi, President of Lancôme International.